After leaving the stunning Kimberley region of Australia, the hubby and I embarked on a marathon tour of Dubai and landed in Maldives - a spectacular tropical paradise that is even more beautiful than I'd imagined (and I found very hard to leave!). I'd always assumed that this portion of our travels would be the least sustainable - there were a number of flights required to get here, and I've been calling a fabulous 5 star resort my home for the past 10 days - more like Unsustainability with style. But now I'm not so sure. In fact, I have so much to share with you I've written two posts - one about the Maldives more broadly and its environmental situation, and one about my personal experience here at the Holiday Inn Kandooma (the nicest Holiday Inn on the planet!). 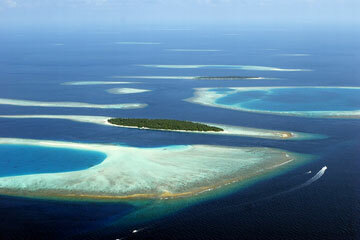 If you haven't heard already, Maldives is one of the nations most under threat from rising sea levels. The country consists of over 1,100 low-lying islands structured around atolls, or reef/lagoon systems, and the average elevation of the islands is a mere 1.5 metres. Reports anticipate the majority of the islands will be submerged by the end of this century. I'll admit it was a sense of morbid curiosity that brought me to this country while the hubby was on a surf safari around the islands; I wanted to see it all for myself before it was too late. And now that I have seen it, I can't imagine not doing anything to improve the future of this lovely country. Damage from the increased storm activity associated with climate change will also have a large impact on the islands. In fact, they are still recovering from the 2004 tsunami. Maldives fared better than many other locations impacted by the tsunami mainly due to the reefs providing protection, but now the reefs are in dire need of regeneration to bring back the health of the important ecosystems under the sea. A sky-view of the atolls. It isn't really a secret that the islands are under threat of erosion, and some of the islands have been busy building sea walls to keep out rising tides. Then last week I saw a disturbing 'solution' to the problem in an article on NineMSN about a new development of floating islands in the Maldives to replace the current ones not able to be saved. Good in theory – climate resilience must now be a major point of discussion in the climate change conversation – but the proposed developments appear to be for the extremely wealthy. I’d like to see a realistic plan for the people of Maldives, the actual residents who will be most impacted as some of the world's first climate refugees. Right now all I see are dollar signs flashing in property developers’ eyes as they think of how to cash in on the international tourists who flock to the islands. Switching gears a bit - let's talk trash, shall we? No, not gossip, but actual rubbish, and what you do with it when you're an island nation. The population of Maldives is under 400,000, but with more than 700,000 tourists visiting each year, who generate an average of 7.5kg of waste per person each day (ugh . . .), it is a huge problem. One of the current solutions is a garbage island, also known as Thilafushi. Not as beautiful as the others, is it? Thilafushi was originally a lagoon, and in the 1990s the government reclaimed the land to use as a rubbish tip. Unfortunately today the result is an unsustainably-managed waste disposal site with constantly burning fires and smoke plumes drifting to other islands. Without going into all the dirty details, it's a huge environmental concern for this country. There are also discussions around whose responsibility it is the manage all the waste, with some suggestions that the international community step up with funding because it's the international tourists who add the bulk of the waste. It does pose an interesting dilemma - without knowing what the regulations are for setting up a Maldivian resort, whose responsibility should it be? What do you think? The rubbish boat at my island - they keep it covered! Residents have told me you can see the rubbish boats floating around, collecting waste from islands and then driving off without covering the rubbish, allowing the wind to whisk away what it will into the pristine waters. 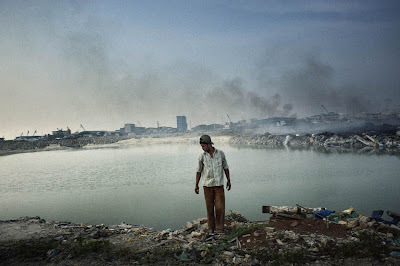 The locals I met are well aware of the troublesome pollution and waste situation (as well as environmental concerns more broadly), but don't have many options at this point or the local expertise to develop a lasting solution. Most 'local' islands (those without resorts) actually burn their rubbish on their own islands, another troublesome solution. resort staff around to keep the waterways clean. Another blow to the Maldivian environmental situation took place earlier this year when the government, and it’s environmentally-minded president, was overthrown by the previous dictatorship. Before the uprising, then President Mohammed Nasheed was striving for the Maldives to become the first carbon neutral country by 2020, and to generate 60% of its electricity from solar without raising energy prices (which turns out would be quite easy - the nation is heavily dependent on diesel and is at financial risk to rising oil prices). Nasheed was an inspirational voice on the international stage, helping to bring human faces to climate change impacts. Now that the government has returned to Gayoom's dictatorship the country’s policies on climate change are increasingly hazy and Nasheed's environmental advisors have resigned. There is hope for Nasheed to eventually return (or another like-minded president). There is an undercurrent of political unrest, particularly in Male, and citizens hope for another democratic election. As a matter of fact, my second night in the Maldives I was in Male, the capital, and right outside my hotel a political demonstration took place. After speaking with hotel staff I learned that these demonstrations occur frequently, citizens demanding a democratic vote, and at times the police are ordered to shoot rubber bullets to disperse the crowds. I was reassured not to worry, ‘they don’t go for the tourists’. I suppose until the government begins taking more of an interest in environmental policy it is up to citizens of the Maldives (and the world!) to keep their environmental sustainability movement moving. Another aspect of 'sustainable travel' is cultural learning/appreciation. It is not that easy to get to know the 'real' Maldivian culture at this point in time, because tourism is heavily focused around the 100+ resorts each on their own islands. There are tours you can do of the local islands, but I don't know that a 1 or 2 hour tour would enable any tourist to authentically connect with locals. According to one article I read, this is something the Maldivian tourism specialists are aware of, and are considering if and how to support more homestays or smaller hotels on local islands. So much food for thought following my visit to this magical country! And while I didn't solve any major climate challenges, and there is not a whole lot of good news in this post, I still found my time in the Maldives to be extremely important and more sustainable than I'd assumed it would be, because I was able to delve into understanding these issues on a personal level. I saw the rubbish burning on local islands. I saw the garbage boats driving around. I saw plastic floating in the turquoise waters. I spoke with residents about their concerns and knowledge. And importantly I had the time and head-space to consider what a tragedy it will be for the world to lose the Maldivian culture and islands if we don't all act swiftly to reduce our impact as well as invest in resilience solutions for these islands. So, while I emitted a lot of carbon getting here, and possibly generated a huge amount of waste (though I think not, according to what I leanred about my hotel), there is definitely something sustainable about seeing these issues firsthand , researching and reflecting upon the information, and sharing it all with you. Oh, and if you're a sustainability professional, Maldives desperately needs your expertise, so it may be time to consider working abroad for awhile! Isn't this worth protecting? I say yes. Get ready for my next post to see what steps the Holiday Inn Kandooma are making to lessen their impact, I think you'll be pleasantly surprised (I know I was!). Thanks Jeremy! It was an amazing opportunity, one I'll never forget.